Former New Dream staffer Wen Lee shares how she’s building community in her California suburb, one project at a time. 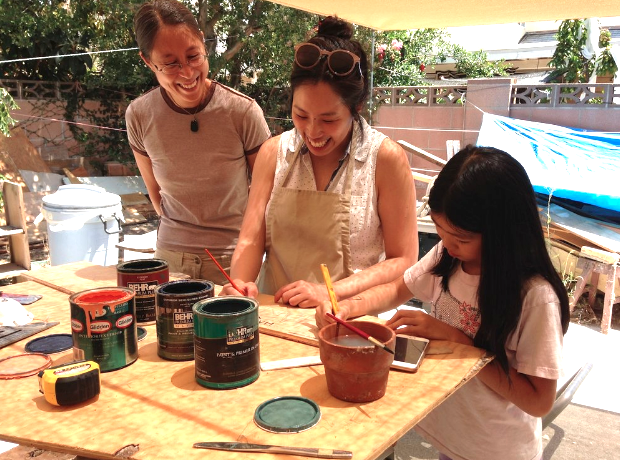 Read more about her and her husband's adventures in joyful living at Frugal Happy. In suburbs like Temple City, outside of Los Angeles, people tend to keep to themselves. They don't open their doors to strangers, they grow shrubbery around their property for privacy, and they travel everywhere by car. As a result, it's not often that we see our neighbors face-to-face. But without face time, it's nearly impossible for neighbors to learn each other's names—let alone become friends, gain trust, and build community. One of the first things I did when we moved in two years ago was to attempt to start an email group for our block. The goal was to connect neighbors so we could share local events and safety alerts and help each other out when, say, someone needed to borrow a ladder or had too many oranges on their tree. I was sure everyone would love the idea. I printed out cute little fliers and stuck one in every mailbox on the street, inviting anyone interested to email me. I was very excited and waited for the emails to roll in. I received one email. Wait—that's not going to work. Two households don't make an email group! This was harder than I thought. I felt disheartened. That was eighteen months ago. Today, I realize that it was silly of me to hope that fliers alone would transform a neighborhood. "Building community is complicated. It takes time, trust, and an openness to learn about a place and understand its culture." Building community is complicated. It takes time, trust, and an openness to learn about a place and understand its culture. It also involves a conscious effort to be a friendly, communicative, and generous member of society. I'm still trying to figure out how to do all this stuff. Surprisingly, we discovered that there was one way for us to contribute to the neighborhood, and it was right under our noses. Our garden! Yep, who knew? Last year we killed our lawn and replaced it with a garden. In addition to providing us with yummy, fresh vegetables and making us feel like badasses for growing our own food, the garden has come with a unexpected side benefit: helping us meet our neighbors. From the very beginning, the garden has been a fantastic conversation starter. Since it's in the front yard, everyone sees it. When we started assembling the planter boxes, neighbors driving by slowed down, rolled down the window, and asked, "Whatcha building?" When we started putting in baby plants, curious neighbors would ask, "Whatcha growing?" Some neighbors seemed skeptical. Others were amused. Some were impressed. More than once, people asked if what we're doing was legal (it blows my mind how growing food in your yard could possibly be illegal). But the point is, conversations were happening. Neighbors were introducing themselves, exchanging names, and becoming friends. The first time I realized something special was happening was when my husband Chris and I were planting our first batch of seedlings last summer. A small, elderly gentleman who lived a few doors down quietly emerged from his house and shuffled over to us. He didn't speak much English, but he came up to us and held out a small bag of seeds. They were amaranth seeds that he collected in his own yard. Scatter these in the soil, he said, they grow like weeds, and the leaves are delicious. Before this, we had never seen this guy or spoken with him ever, and here he was walking down the street just so he could share his seeds with us. Wow! We were so touched by his act of generosity and thoughtfulness. As time went on, more and more neighbors stopped by the garden. Distrust and discomfort melt away when someone is sharing homegrown vegetables and fruit. It's such a fun way to meet new people. Sharing begets more sharing. 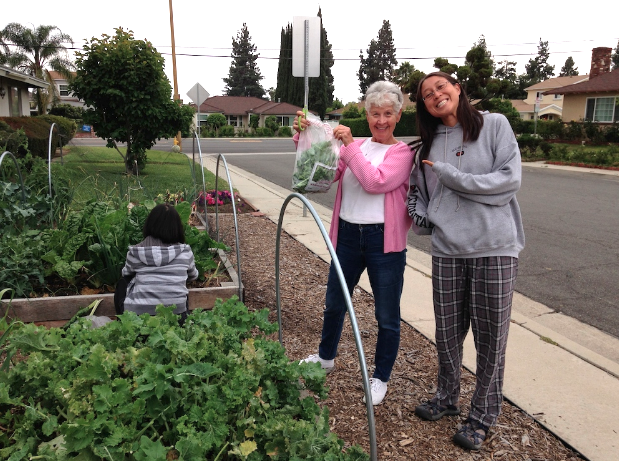 We offer garden vegetables to a neighbor across the street. The following week, they lend Chris tools that he needs for his construction work. I help translate a notice in the mail that they can't read. They keep an eye on our house when we're out of town. It's a positive feedback system that everyone benefits from. Chris and I are amazed by the social power of our garden, and we think it stems from a universal love: food. Food is something that all people relate to, regardless of age, culture, race, politics, or background. It is a starting point for building friendships. Our street is still a quiet place where people mostly keep to themselves. But I'm grateful that we can offer our garden as a small way for neighbors to connect with one another. We are not only growing vegetables, but a sense of community as well. 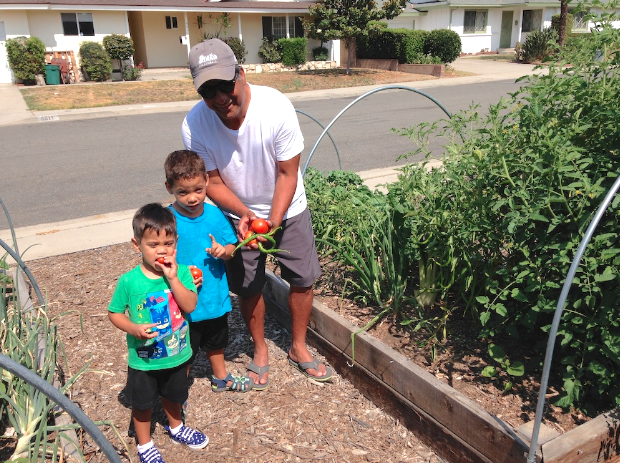 "I'm grateful that we can offer our garden as a small way for neighbors to connect with one another. We are not only growing vegetables, but a sense of community as well." Last summer, our front-yard vegetable garden was especially bountiful. We found ourselves with more squash, tomatoes, and eggplant than we could eat on our own. I started putting extra veggies on a chair on our front porch to share with our neighbors. This sort of worked, but since people couldn't see what was on the chair unless they walked up to the porch, it wasn't very efficient. This made me think: What if we moved the chair next to the sidewalk? Also, what if instead of a chair, we had a cute little stand? And what if we invited all neighbors to contribute items too? The idea for the "Share Shed" was born! We placed the Share Shed in the front corner of our yard, next to the sidewalk so people can easily see it when walking or driving by. The sign says: "Everything here is free! Take what you love; Donate what you don't need. Sharing builds community." I also stuffed little fliers (in English and Chinese) in everyone's mailbox on the street explaining the Share Shed and what it is for. That way all the neighbors know that it's a community resource for everyone to use. I purposefully kept the language vague, not limiting the Share Shed to just vegetables. Maybe some neighbors would contribute fruit or other foods, or even non-food items like books and toys? I wasn't sure and wanted to leave it open. So, has the Share Shed been a two-way exchange? Well, not too much so far. Most of the activity has been us sharing our garden vegetables. However, I think the sharing concept is a new one for our neighborhood (for most neighborhoods, actually), so it's understandably a little slow to catch on. "I think the sharing concept is a new one for our neighborhood, so it's understandably a little slow to catch on. " As far as I know, there have been two instances when other people besides us contributed to the Share Shed. The first was when some homegrown jujubes appeared in the Share Shed (woohoo!). The second was pretty surprising; I walked out one day and there was a leather backpack sitting in the shed! Very exciting. The backpack raised some questions. It was the first non-food item in the Share Shed, and Chris said to me, "Ummm, what if no one takes the backpack? Will we have to take it to Goodwill? Is this going to become a dumping ground for people's unwanted crap?" The backpack disappeared a few hours later that day (yay! ), but nevertheless these are good questions. Here's the thing: the whole thing is an experiment. I don't know what will happen. But I want to try. Will neighbors use it? Will outsiders start stealing stuff? Will it just sit there empty, gathering dust? We'll find out. If the Share Shed is a total failure or causes problems, we'll simply take it down. Easy peasy. But if it makes people smile, helps us share resources and reduce waste, and brings the neighborhood closer together—I call it a success. 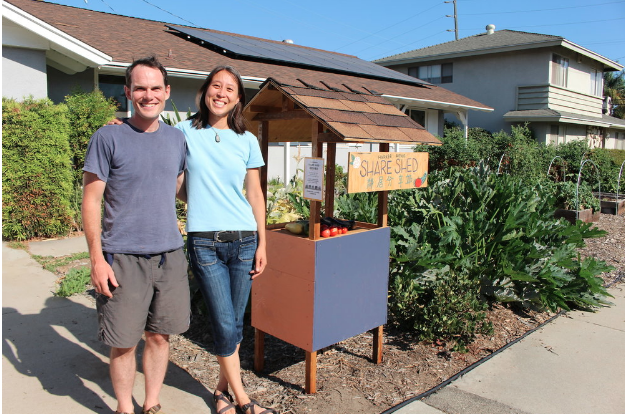 Want to build community or start a sharing project in your neighborhood? Take our Community in Action Challenge, and we'll provide resources and support!